I'm not seeing any way to adjust spacing between lines, only where to adjust character spacing. Well, you can adjust the leading: it is in the bottom left corner of the panel Positioning and Transform. It is called Leading Override. But you are right that is not easy to find it. Beside the choice of name (why don't you call it simply ‘leading’?) I think that the position of this command is wrong. 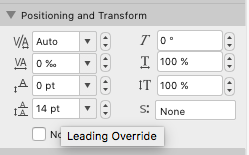 The leading is often one of the commands you use the most, and it should be placed close to the type size (as in Indesign, Xpress, and older DP software). In Affinity products leading is a paragraph attribute and therefore in the Paragraph panel and in the paragraph section of the text context toolbar. Setting leading once per paragraph should result in more consistent results. What the Character panel has is something slightly different: it's a way to override the paragraph leading just for a few characters, usually to fix some problem such as a font having a different visual size. Thanks. Now it is clear. I still think that having the leading command in a different panel than type size command is a waste of time for users. But if this is your policy throughout different pieces of software, I don't have much to say. Upside down and mirror image. I used the California cases, I think that is what they were called. You ever pie the type? Worse than composing was distributing the type. Could have been worse. Could have been hot lead from a Linotype! Well, you listed products that are not what I consider standards for layout design. Are those the range of software among which Affinity Publisher should be placed, rather than Quark Xpress or Adobe Indesign? Could have been hot lead from a Linotype! That smell, that hot lead smell. It smells like victory. Sorry if I didn't explain; my reply wasn't aimed at experts like yourself, but to assist newbies who may have never heard of Quark Express or Adobe's InDesign but have experience of word processing and want to try Desktop publishing for themselves. Here's a thought. If InDesign is so good why are there so many InDesign users complaining about Publisher not working like InDesign does. Can you remember 15 years back when it was introduced? (and it wasn't completely new but based on years of development in Adobe Page maker). Could it do as well then as Publisher Beta does at the moment? Sometimes we mere mortals can only ask for improvements/make suggestions/report bugs to Serif the backroom boys and hope that they can develop the complex code to provide what we'd like. I do hope that Serif wants to position it within the desktop publishing software, because I cannot see any need for new word processors, while there is need of a lighter and cheaper piece of software than Indesign. Most of the functions I've seen in Publisher seems to point toward this directions. For this reason I insist that keeping leading in a different panel that the type size is a mistake. If you design a layout (unlike if you set a plain text) changing leading is one of the actions you do the most. The way MS Word and other word processors handle leading (as much as many other things, as the OT feature) is simply ridiculous. They were designed by people who had never designed a layout. This is the way layout is seen in the traditional Swiss school, but it is a bit over nowadays. It is generally considered too strict. I personally love grids, but that is another matter. The point is that graphic designers usually need to test and try (rather than design out of the blue following prefixed rules) and to test and try layout configurations you often need to play with leading. Are you aware that leading is also found in the text context toolbar, at the top of the view? So like pointsize it is always available whatever panels you have visible. 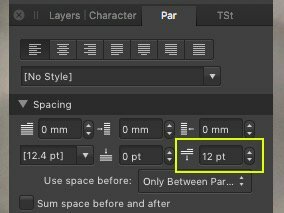 Paragraph leading in InDesign is very limited, so it doesn't get used much and everyone sets leading on characters instead. We feel that is less good typographically. Leading should really be a property of the entire paragraph, and therefore logically should be in the Paragraph panel. Really? I think I can count on one hand the times leading has been overridden for the files I have received (and I really never do). That's going back to v.2 of ID. The few times I have found it, only once was it appropriate for the paragraph I found it in. But yes, unless there is a really good reason to, leading should be used as part of a p.style. No, I did not realise it. So, my complaining is pointless. That's the beauty of forums! Someone points out the obvious which so often we users overlook. I had overlooked the leading control in the text panel even when I set columns in the text panel and columns setting is right beside it. So much easier than going to Paragraph in Studio tabs and setting leading there, though of course there are other paragraph controls in Studio such as first line indent, left and right indents which a user might be wanting to set at the same time. Putting this here as it's related. Whenever I create a new document and put a text frame on it, there is always 12pt spacing after each paragraph. This means I have to change this every single time which gets very wearing. Can this be stopped? Also, can you set a default font, point size and leading for new text frames within Preferences so it is the same for every new document? Set the defaults how you want them and then use Edit > Defaults > Save. So I have to create a new document, set the font, point size and leading within a text frame and then use Edit ▸ Defaults ▸ Save? Yes. And set Space After to zero. Art text has different defaults to Frame text, so you may want to set the font and leading for that, too.